This year’s London Book Fair (LBF) saw a skein of the Golden Egg team flying into Olympia. We were lucky enough to be able to share a little space with the ever so supportive Golden Egger, Director of Quarto Translations and Co-Founder of the Quarto Translations/Golden Egg Academy Diversity Award, Robin Bennett. Also based on the stand were the fantastic Firefly Press team, headed up by our very own Industry Specialist, Penny Thomas. Almost back-to-back with agent and publisher meetings, the team and I fielded questions, made new friends, said hello to old ones and showcased some of the exciting new GEA titles almost ready for submission. It’s clear that what agents and publishers are after at the moment is young, funny fiction and beautifully written middle grade. Young Adult is still a tough market with agents saddened that they can’t place the wonderful novels that they currently have on their lists. However, there were some agents prepared to buck the trend and there is a definite desire for tween escapism, a niche not yet being filled. In any case, the general feeling on teen and YA is ‘what goes around, comes around’ so don’t be too disheartened! Other things talked about with great enthusiasm at the Fair were audio books – and the importance of screen free time! – story across media platforms and the celebration of inclusion. I attended a great Inclusive Minds talk about the importance of ‘window’ books and ‘mirror’ books – one kind offering a window into another culture, gender, ability, experience and the other reflecting the character and experience of the reader themselves. I was lucky enough to be able to speak to Aimee Felone of KnightsOf about running a half day workshop on just this subject, so watch this space! We had such a brilliant fair this year! We met with lots of agents and editors to pitch new GEA titles to them, and discuss current market trends. The headline news is funny, younger fiction tops the wishlist for most agents and editors. Sunny teen fiction in the vein of Louise Rennison to bridge the gap between Middle Grade and YA is also pretty high up the list. YA remains quite difficult but there is always room for outstanding novels with perhaps a more international feel rather than so wonderfully and authentically British. The thinking is that there’s a desire for novels offering an escape from everyday realities – so, fewer local comprehensive school settings and UK centric issues. It was fantastic to see lots of interest in the Academy from new publishers launching exciting children’s lists and a variety of writer support services. A personal highlight was meeting with Aimée Felone, founder of Knights Of to explore various ideas and opportunities to embed inclusion across all aspects of our work. It wasn’t all work as we found time to attend the Independent Publishers’ Guild (IPG) drinks reception on the Wednesday, where our friends at Firefly were up for an award. We were also at the Firefly party the next day to celebrate their recent successes, and to support Egg Emma Rea, author of the wonderfully evocative My Name is River publishing in 2020. Best of all was spending time in person and working the fair with our marvellous team. The LBF was wonderful. I went with multiple hats on: part of GEA, an author, university hat. I always forget how big and overwhelming it is when you get there. A gigantic hall full of wonderful book-ishness everywhere you look. I was lucky enough to have some amazing meetings lined up plus I caught up with great friends old and new. I had a wonderful time with my GEA peeps too. Adamma, Charlotte and I wandered around during lunch having a good look at the stands, checking out what was being published. It’s lovely to be able to spend time with them. I also had a fabulous meeting with Imogen and Charlotte Eyre, of The Bookseller, where we were able to discuss the QT/GEA Diversity Awards. I caught up with the Society of Authors (SoA) and the Society of Editors and Proofreaders, which proved very useful. With my author hat on, I met my gorgeous editor, Janet Thomas, from Firefly Press, where we talked about future projects. I also saw the fabulous Ben Illis, where I took the opportunity to sign with him! Even on the train home, I caught up with Emma Lowe, also from The Bookseller. All in all, it was an amazing, if exhausting, day! You have to love the LBF and all the dreams that are being created there. To me, a writer finding an agent or publisher is all about finding the right match. Although there was plenty of discussion at LBF about what was doing well in the market and what these editors and agents are looking for, it was great to be reminded that this is often unpindownable, and there are always writers and books that go against the grain. One editor told me that they usually say historical novels aren’t for them, and that YA is hard to make successful at the moment – but that they’d recently bought an historical YA they were really excited about. I also attended a talk about child readers as consumers and heard some fascinating feedback from a study on this, where these readers were simultaneously expecting online shopping to be the norm in the future, with their data being used to customise their retail experience and drones delivering everything, but also very clear about how physical shopping was important for browsing books and how highly they valued the social experience and independence of shopping on the high street. Both these were great reminders of the dichotomy that exists within writing, publishing and the book market. As ever this was underlined by the range of tastes, requests and feedback of the various editors and agents I met with over the two days. If you ever needed convincing that having a strong concept and perfecting your one-line pitch are essential, then going to LBF would be it! Each meeting with an agent lasts for 30 minutes and in that time 15–20 books can be pitched. One quick line is all the time you have. If the agent expresses an interest in that one line, you have a few more sentences to sum up the key story and then the agent will give a nod if they would like to see more (and the manuscript will be sent to them after the fair). That is literally it. 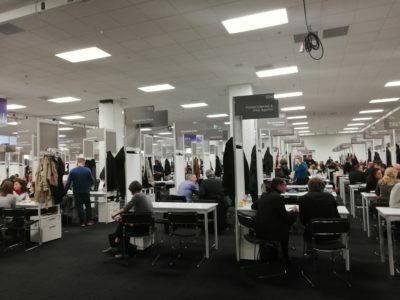 And of course, that process is being replicated throughout the fair, from agents selling to publishers and publishers selling to foreign publishers. This is the agent’s room upstairs at the fair… imagine 35 rows, about 20 tables deep and you’ve got the idea. There’s loads of goodwill towards Golden Egg and plenty of enthusiasm from agents who want to get involved in what we do and come to events and workshops. It’s a whirlwind of a day, but an amazing thing to be part of. 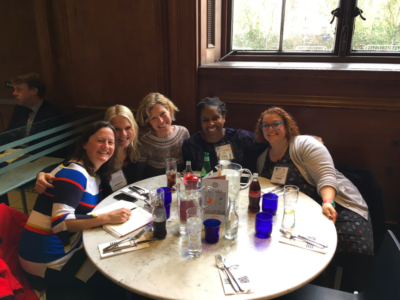 LBF 2019 kicked off with an intense round of meetings in which we shared some of our talented writers’ work with some of the best agents and publishers in the business. Industry insiders were thrilled to hear how well Golden Egg is doing and impressed by our success rate. What about the industry news, I hear you ask? Well, publishers are seeking funny fiction for a younger middle grade audience through to a YA audience. YA is still an incredibly hard sell and will only appeal if it has an international feel. Middle grade is as popular as it has always been. That’s the big news from the fair. Now it’s time to get back to editing all your wonderful stories. I’ve been going to LBF for quite a few years now, pre-Firefly this was generally for my own interest: it’s always fascinating, overwhelming and too hot. In Firefly’s first year we paid a not insignificant sum to exhibit two books on a shelf with the Independent Publishers’ Guild, who are superbly helpful to small publishers. So 2019 was amazing for us as we had our first-ever Firefly stand in the Children’s Hall, shared with Quarto Translations. This meant that instead of rushing round with armfuls of catalogues and a diary we could stay put and receive guests! Over three days our key staff were outstanding, had numerous meetings, particularly valuable for those of us outside London. We saw publishers, agents, authors, suppliers, printers and children’s book promoters. We pitched our 2019 books to the trade, courtesy of the Publisher’s Association, and wound up with a Firefly reception at 11am on the last day, for which, given the early timing we stocked up with soft drinks and just a little Bucks Fizz, which instantly vanished, leaving us with only bottles of water and lemonade to transport around London. A final highlight was a post-fair event at the NOW Gallery in Greenwich with two wonderful Firefly authors, Horatio Clare and Catherine O’Flynn, chaired by our editor Rebecca Lloyd, talking about their favourite children’s books and influences, and reminding us beautifully what all the fuss was about in the first place!